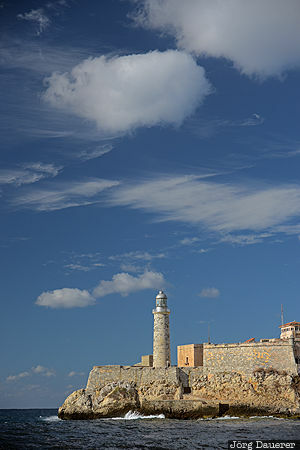 The lighthouse Faro Castillo del Morro on the ramparts of the Castillo de los Tres Reyes Magos del Morro at the harbor of Havana seen from the Malecón of Havana. Havana (or La Habana) is the capital of Cuba. This photo was taken in the afternoon of a sunny day in February of 2016. This photo was taken with a digital camera.